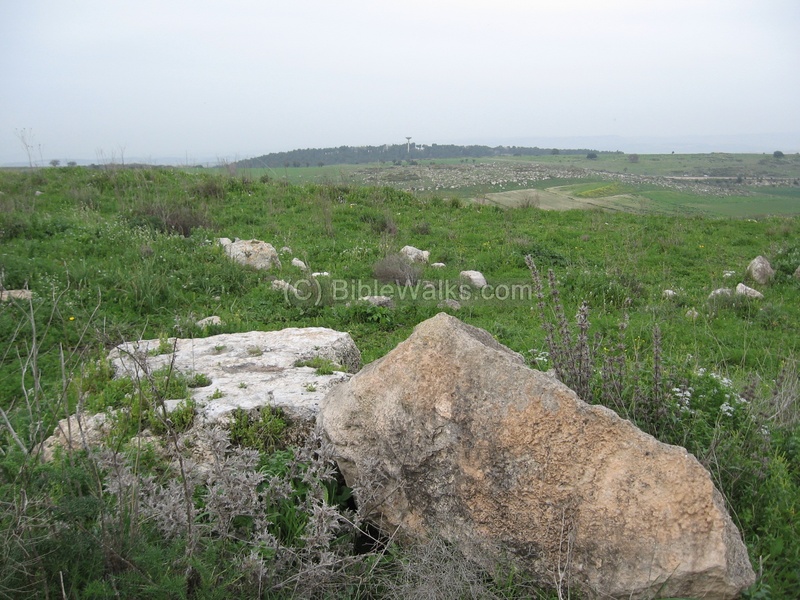 Khirbet Sharta is the ruins of a small village in the north-east part of Kiryat Atta. Khirbet Sharta is the ruins of a small village that existed from the Biblical (Iron) period, up to the Roman/Byzantine period. The site is located on two hills, an eastern hill and a western hill, and are 300M apart. Both are located on the north-east side of Kiryat-Ata, a city near the bay of Haifa which has several ancient sites located among its neighborhoods. The larger eastern hill is damaged but the ruins are still visible and can be visited. This site is surrounded on all sides by neighborhoods, roads and an abandoned city dump. The fate of the smaller site on the west hill is worse; it is long gone, and buried under a park and residential buildings. In ancient times Kh. Sharta was located on the east-west road from Via Maris (the main ancient highway). It was in the middle between Tell Afek (the main city in this area) and Khirbet-Usha (which was, for some time, the place of the Sanhedrin during the Roman period). 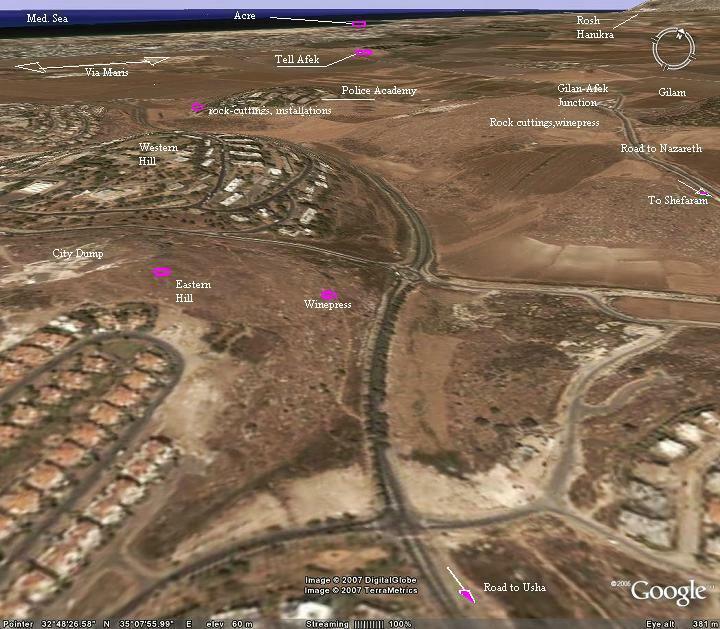 The eastern hill is located on the left side, and is located on a hill between two neighborhoods in Kiryat-Ata and a abandoned city dump. The modern road, seen in the center, was the path of the road from Tell Afek (located on via-Maris, the main ancient highway) to Usha (located 2KM south-east to Khirbet-Sharata). The sites were first populated in the Iron Age (12 C BC), according to the ceramics found in the sites. They continued through the Persian, Hellenistic, Roman and Byzantine periods. On the west hill site are remains from the Mameluk period as well. The name "Atta" or "Ata" came from the name of the Arabic village "Kafritta". The root name "Ata" is unknown. It might have been listed by Josephus Flavius as one of the fortified cities (Wars 2, 20, 6), named as Kapharatha, but the name was later written with errors as Kefar-Eicho. In the 19th C it was a small collection of mud houses, and named on the maps as "Koufour Tai" (Napolean Map in 1799) and "Kefr Etta" (British Survey, 1875). In 1925 a group of religious Polish Jews purchased the land and settled in the ruins of the Arabic village, and renamed it "Kefar-Atta". Later (1969), it became a city and renamed Kiryat-Atta or Qiryat Ata (in Hebrew Kiryah means city). Link: Municipality home page (Hebrew). On the eastern hill (site #54) a stone wall (150M long) is built with a double row of large stones, and a small stone fill, running through the center of the ruins. Also, there are rock cuttings and two winepresses cut into the rock. On the western hill (site #47) several burial caves were found, including a burial cave cluster from the Roman period. However, today there is no sign of these caves, and the whole area is covered by a park and the residential buildings. On a hill, west to Khirbet Sharta, there are additional tombs, rock cuttings and installations (sites #28 and #46 in the survey). This hill is part of the police academy compound. Another hill to the north has additional rock cuttings and a winepress (sites #30,31). An aerial view of the eastern hill is shown in the quad copter view, from the north side. Only the north half of the mound remained intact, as modern construction cut away sections of the site. The neighborhoods of Kiryat Atta are located on both sides of the site. Mount Carmel is seen in the far background. The next photo, taken during the winter, is a view at ground level. The hill is full of rock cuttings, indicating that the village may have started from the rock cutting for the nearby villages and for its own buildings. Another view of the site, looking north. The road eastwards (right) to Shefaram and to Nazareth is seen in the background. A round pillar is left from one of the buildings. One of the two winepress holes cut in the rock, and were part of the agriculture facilities of the village. About 2 KM west to Khirbet Sharta, on the north-western slopes of the hill of the police academy, is a cluster of rock-cuttings, agriculture installations, and a cistern. The stone quarry included different types of round and rectangular stone cuttings, such as seen in the photo below. The site is adjacent to the modern road between Kiryat Atta and Gilam-Afek junction, and may have been part of the stone quarry of Khirbet Sharta. Some of the rock-cuttings were stopped in the middle of the cutting process, such as the round stone in the following photo below, where a crack in the rock may have been the reason for aborting the cutting. On the left side is the cavity of a stone that was successfully extracted from the rock. Although there are not much of the archaeological remains, the hill is covered by flowers in the winter time. For example, a large number of Rakkefet ( cyclamen persicum). There are also the red Kalanit (anemone flower) and the light-purple iris called Tsaharon (Barbary Nut), that in this case grew together side by side. The latter means in Hebrew "noon-time" , since it opens its flowers in the noon time. In addition to the wild flowers, there are also herbs on the hill side. In the photo below is the popular herb Zaatar (hyssop), which is an essential herb in the Arabic spices and also very popular in the Israeli kitchen. It is also in the Bible (Exodus 12:22): "And ye shall take a bunch of hyssop, and dip it in the blood that is in the basin, and strike the lintel and the two side posts with the blood that is in the basin; and none of you shall go out at the door of his house until the morning". This text, describing the land of the tribe of Asher, lists the city of Aphek and "their villages". Probably Sharta was one of these villages of Aphek. "And the fifth lot came out for the tribe of the children of Asher according to their families. ... and Aphek... twenty and two cities with their villages". 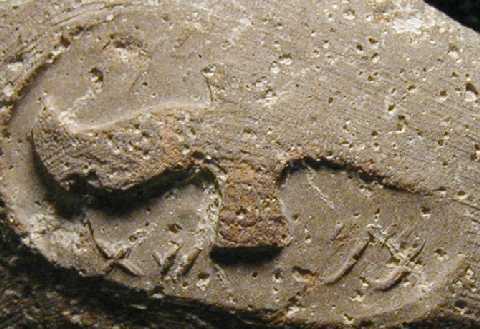 A LMLK ("to the King") seal was found in K. Sharta and published in the 1965 report. The icon depicts a 2-winged light/sun, & the inscription reads "MMST", which could be related to the word translated "dominion" in 2Kings 20:13, "power/force" in 2Chronicles 32:9, & "government/authority/responsibility" in Isaiah 22:21. All 3 passages refer to events contemporary with the production of LMLK jars, a type popular in the south of Israel but rare in the north. This indicates trade with the south. See more details in LMLK website. This seal type also appeared in Israel's 1948 stamps, also on LMLK site. Sample of LMLK seal impression upon an Iron-age jug handle similar to the one found at K. Sharta in 1965. This particular photo is from an unprovenanced collection courtesy of www.LMLK.com. Khirbet - ruins in Arabic. In Hebrew - the root name (Kharav) means ruin. Kiryat-Atta - In Hebrew "Kiryah" is a city (appears 12 times in the old testament. For example: Deuteronomy 3,4: "And we took all his cities at that time, there was not a city which we took not from them, threescore cities, all the region of Argob, the kingdom of Og in Bashan". The 2nd city in this sentence is in Hebrew "Kiryah", but was translated as "city".